They operate a 12-stall barn on about 13 acres. They have about 15 horses in training, and limit the number of horses so that the two have time to adequately train them. They train horses for amateur riders and work with the horse to fit the rider. They also have programs for certified trail horses, emphasizing pleasure riders. They train together and have developed a successful system for training these very fine horses. “We begin by giving definition to what’s good and not so good in the horse,” Sharon explained. “When everything is right, we leave the horse alone and give the horse the opportunity to show what he/she can do. We let the horse be natural, rather than try to train something into the horse. The horses also perform at walk and canter. In addition to these three, there are also specialty classes for Paso Finos. 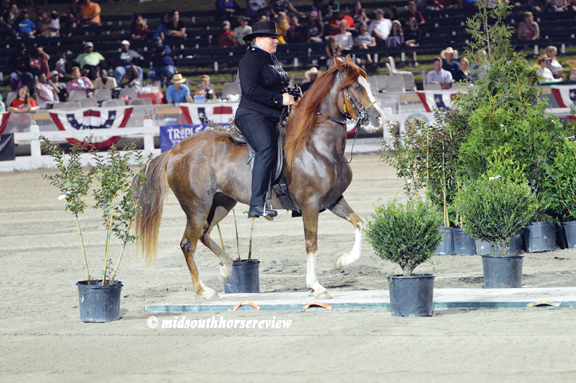 These include western riding, trail, costume, and versatility, in which some Paso Finos jump. The majority of Paso Fino horses originated in Colombia, with some from Puerto Rico. American Paso Finos are usually a combination of both ancestors. There was a time when they were joint-registered with the Peruvian horses. But the Peruvians started to separate the registry in the early 1980s. They use DNA testing on the parents to verify the lineage and keep the registry protected. Beginning in 2019 they will use microchips in the horse for identity protection. And, by the way, Paso Finos come in all colors. Sharon said they show at a few qualifying shows and finish the season with the national competition in Perry, Georgia. A major show for the Paso Finos is the World Cup of Youth Equitation in Ocala, Florida, July 19-22nd. Find out more about this show at: www.pfha.org. 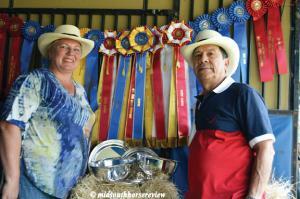 Sharon has a degree in Equine Science and is President of the Paso Fino Horse Association.